Posted on 8, June 2016 by EuropaWire PR Editors | This entry was posted in Business, Germany, Management, Technology and tagged Mexico, René Schlegel, The Bosch Group, “Year of Germany in Mexico”. Bookmark the permalink. Mexico City, 08-Jun-2016 — /EuropaWire/ — The Bosch Group is continuing its dynamic pace of growth in Mexico and further expanding its activities in the North American country. The supplier of technology and services achieved a nominal sales growth of four percent and total sales of 861 million euros in the country last year. In this way, Bosch succeeded in expanding its business in Mexico for the seventh consecutive year. “We expect positive development for all our business sectors in the current year as well,” said René Schlegel, president of Bosch Mexico. The company currently employs more than 13,000 associates in Mexico – one-third more than in 2012. “We plan to hire more than 3,000 new associates in Mexico over the next three years,” Schlegel said. Bosch sees particularly good potential for its business with innovative mobility solutions. Mobility is also one of the focal points of the “Year of Germany in Mexico.” This initiative, which kicks off on June 6, 2016, is run by the Federal Republic of Germany under the direction of the foreign office. Bosch is one of the initiative’s main sponsors and by participating aims to further strengthen its reputation in the country. Bosch also aims to further expand its local presence in Mexico. The company is planning to invest more than 90 million euros this year. For instance, the Mobility Solutions plants in San Luis Potosi and Aguascalientes will be expanded. In mid-June 2016, Aguascalientes will start production of the ABS and ESP vehicle safety systems for the local market. In Querétaro, which is located in the central Mexican Bajio region, Bosch is building a 15,000-square-meter manufacturing site for automotive steering systems. It will be Bosch’s eleventh location in Mexico. By 2019, Bosch plans to invest around 70 million euros and employ more than 600 new associates at the site. “Our investment in the new location underlines our confidence in the continued growth of the Mexican market and demonstrates our long-term commitment to the country,” Schlegel explained. This investment is just the latest in a long line of expansions for Bosch in Mexico. Between 2012 and 2015, the company invested a total of more than 360 million euros for the expansion of manufacturing facilities and development activities. Of this amount, a large portion went to the Mobility Solutions plants in Toluca and Juarez, as well as the Security Systems plant in Hermosillo, where new manufacturing lines were put into operation. These plants manufacture for the local market as well as for North and South America. 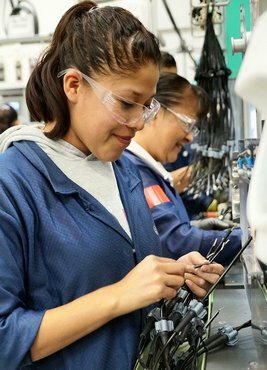 In 2015, Bosch opened a new plant for thermotechnology in Tepotzotlan which manufactures gas-fired instantaneous water heaters for Mexico and Latin America. Mexico is also becoming an increasingly important development location for the Bosch Group. In 2014, the company opened its first software engineering center for the Americas in the Mexican city of Guadalajara. There, Bosch currently employs around 200 associates. This figure is expected to increase significantly in the coming years, making Bosch an important employer for specialists from the software and IT industries. Bosch has been present in Mexico since 1955. Today, the company is active in the country with all four of its business sectors. The business with automotive original equipment saw particularly good growth last year. In addition, the Drive and Control Technology, Security Systems, Power Tools, and Thermotechnology divisions achieved double-digit growth rates in 2015. Last year, the Packaging Technology division established a joint venture with the Hubapac Group, which is specialized in the Mexican pharmaceuticals market. In view of the country’s current health profile, this market offers increasing potential. Furthermore, Mexico’s food processing industry is the tenth largest worldwide. Bosch also sees good long-term potential in the Mexican market. The country is the 15th largest economy in the world and has a similar importance in international trade. The member of the NAFTA free trade zone is the seventh largest car manufacturer and the fourth largest exporting nation in the global automotive industry. After recording growth of 2.5 percent last year, the International Monetary Fund expects the Mexican economy to grow on a similar basis over the coming years.